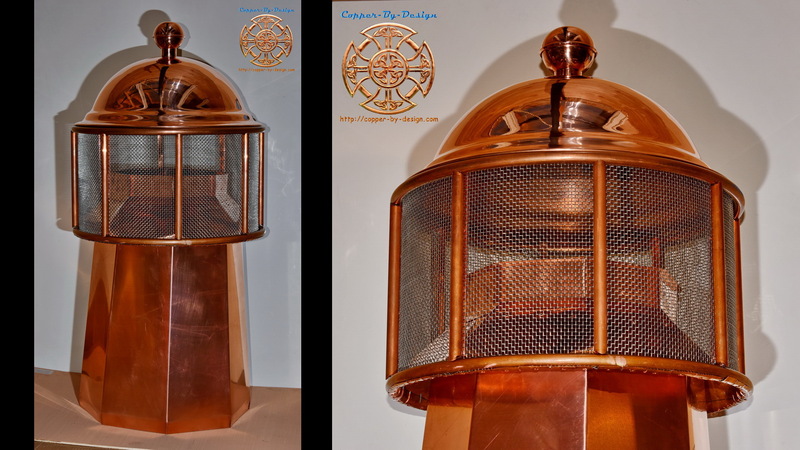 Even though most of the work I do is custom work, here are a few projects I've done that show the diversity of what I can do to solve your needs and desires. Below are links to the different web pages of the custom sheet metal fabrication I've done. 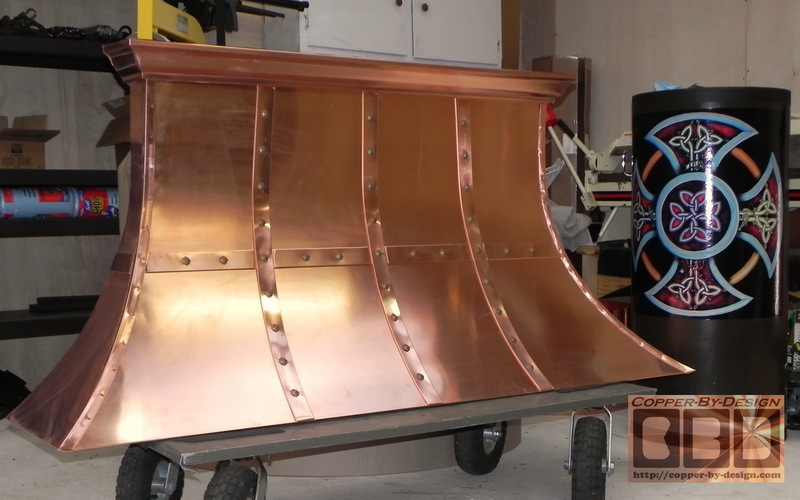 Even if your needs are different than what is shown on these pages, this shows how I'm able to help brainstorm solutions, design, and fabricate nearly anything you may need. 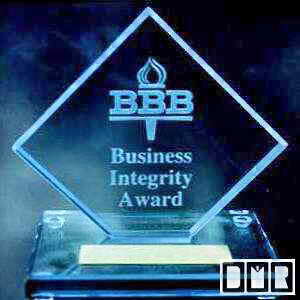 Most of my client are not local to us, so I do ship orders all across the Nation as well. Don't be shy and write me an e-mail to ask if we can help with your project. 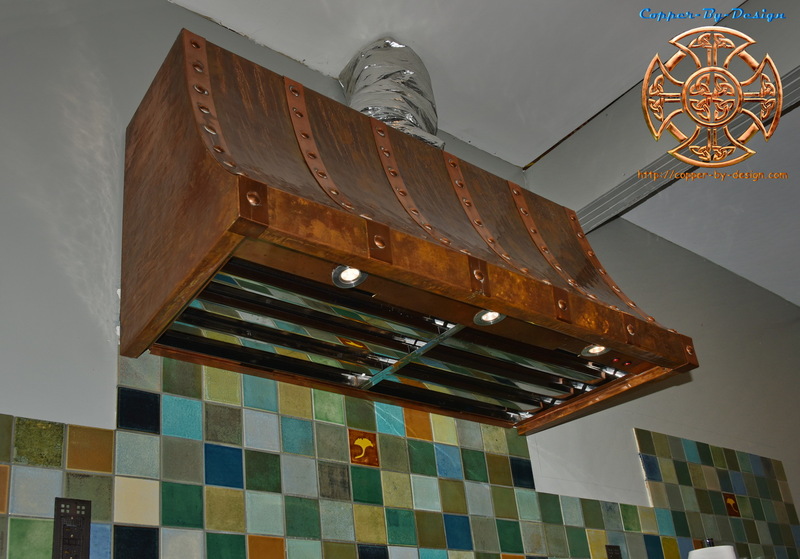 We made this small range hood for a super nice couple whom run KooKooLan Farms; Koorosh & Chrissie Zaerpoor, www.kookoolanfarms.com. I instaled aluminum gutters as part exchange for some grass fed beef we got from them. They are a great source for truly organic produce and meat if you are willing to drive out to their cute farm in Yamhill. This is made with a heavy duty 32oz copper to be 20" deep X 23" tall X 50.25" wide, and quoted to cost $2.1k or less. The cabinets were not yet installed to the sides of this hood. 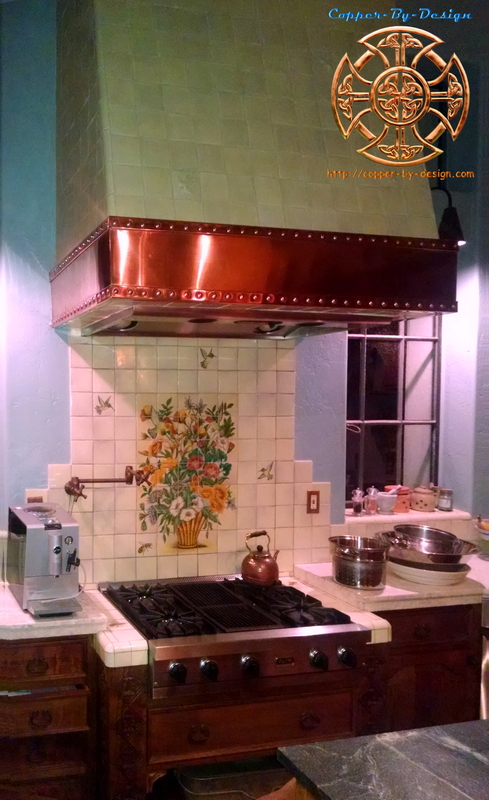 This was a custom standing seam concave stove vent range hood made in 20oz copper and 3/4" copper pipes for a client David & Mary Snyder in Liverpool, New York who wanted this industrial look. It has 3/4" plywood across the bottom treated with tung oil. Total weight 56# w/plywood. 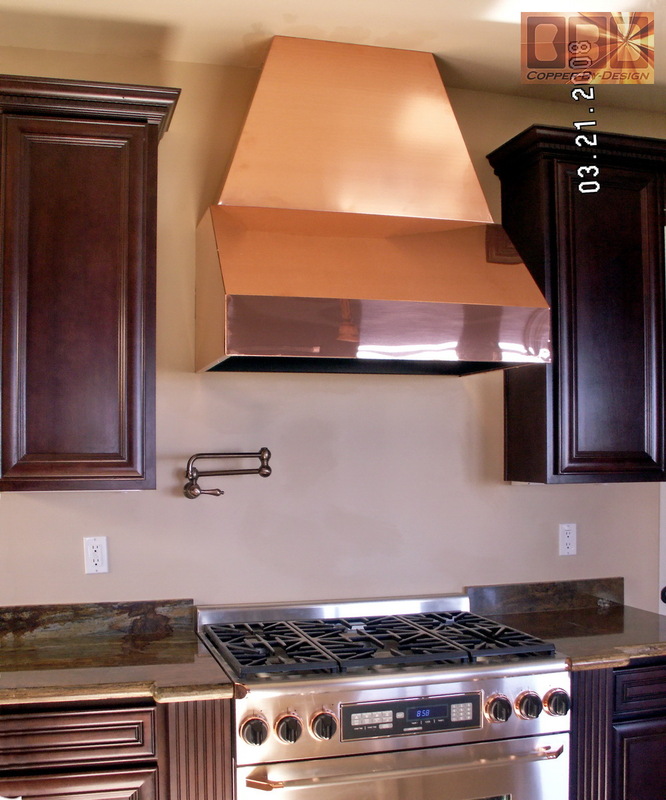 The side rim does not continuer back to the wall to accommodate the cabinets. 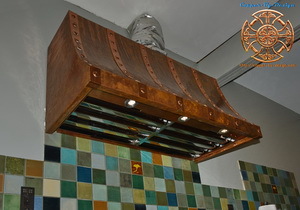 This will rest over an arched brick enclosure around their oven/stove top. The bottom edge is 28.5" deep X 72" wide. 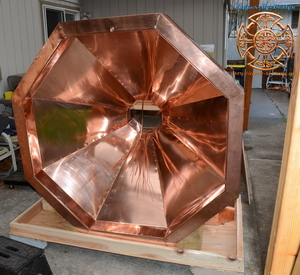 The top is 15.5" deep X 46" wide, and 13.25" high. 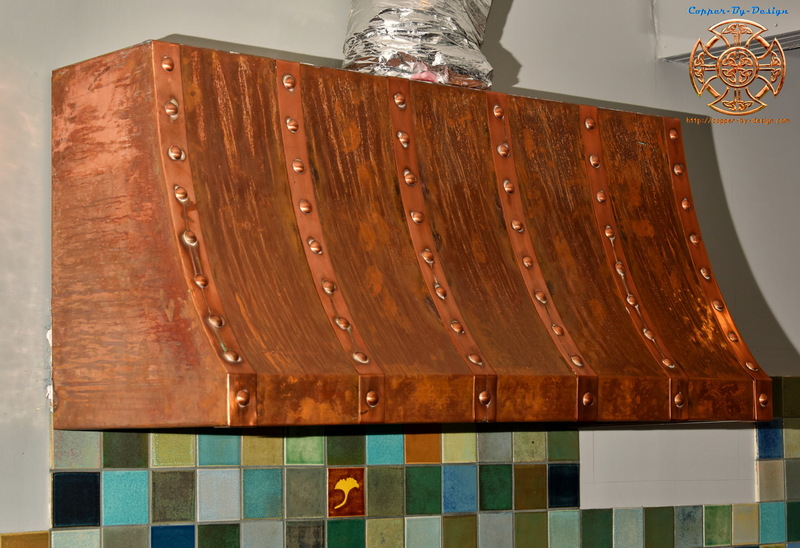 This was a custom exhaust hood made in 20oz and 24oz copper for the outer shell for a client named Jon Bisher for the Hearthside Grove Motorcoach Resort 2400 US 31 North, Petoskey, MI 49770. 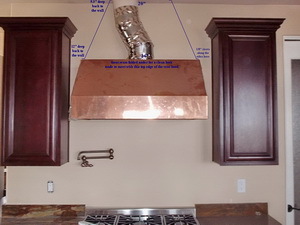 The first image on the left is the outside of the hood, which is a twin wall, as you see in the underside shot on the right. 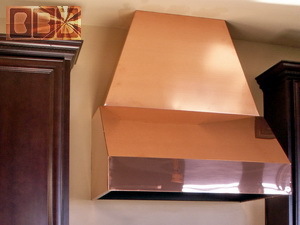 The bottom rim of the hood is 60", 48" tall flue at 15" wide, and an 18" flue w/weather-head. 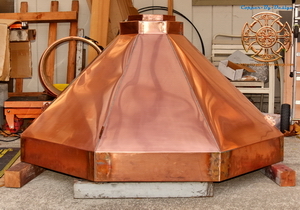 This is to be suspended by the set of 4 ga solid copper wires attached. This was a custom stove vent hood cover made in copper for a client named Emily Lukacz in La Jolla, California, who wanted this industrial look. 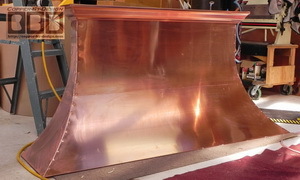 The bottom edge is 32.5" deep X 52.5" wide, and 9" high. The bottom size is 16.5" deep X 76" wide. 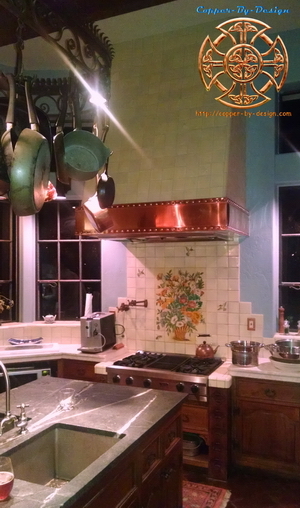 The top is 4.25" deep X 51.25" wide, and 36" high. 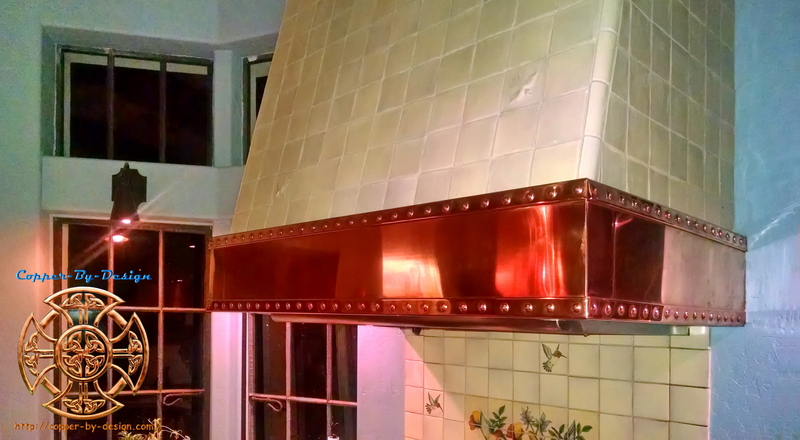 This was just a simple custom copper cover for above this range hood made by another shop. They wanted a good way to cover this unsightly exhaust pipe that was left exposed. The first image on the left is my computer rendition to show them the dimension and shape I was suggesting. 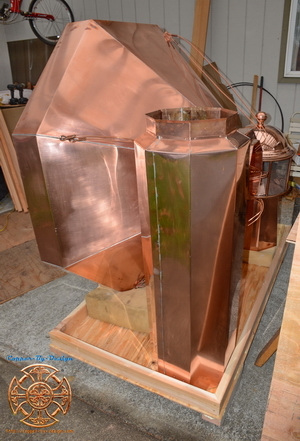 It was made all in one piece with no seams and they report it fit like a glove.